Do you keep your business filing system in a box or plastic bag? Do you get frustrated trying to find a specific receipt or bill that you just don’t know where in the mess of papers it is and you have to find it right now! It’s time to straighten your paperwork! These are my best tips on how to file your bookkeeping and accounting documents so it is easy to find whatever you need, fast and avoid the messy paperwork-in-a-shoe-box syndrome. 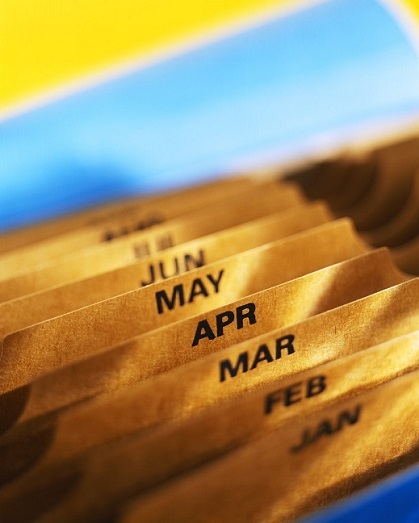 Control your filing system with physical folders you keep on shelves or in filing cabinets. I talk about all that on this page. Benefits: If all power sources or wifi and mobile data facilities fail, you still have all your printed documents to work with. Control your business filing system with a computer filing system either on your computer’s hard drive or in the cloud. Benefits: This digital method is becoming increasingly popular as people move away from physical folders towards virtual filing. Document sharing is much easier with online storage. Physical folders take up a lot of space and can be damaged in a disaster – this problem is non-existent with virtual filing. The number of folders or binders you need will depend on how many transactions your business carries out. Very small or new businesses can start off with one folder filled with dividers for each section. As the business grows the sections can be split out into new folders. Inside the unpaid bills put a-z alphabetical dividers so that the bills can be filed in alphabetical order which makes them easy to find, especially if you have a high volume of bills. In the paid bills file put Jan-Dec monthly dividers. When the bills are paid, pull them out of the unpaid bills, keep them in alphabetical order but this time file them into the relevant month in the paid bills file. What do I mean by relevant month? If you entered a bill into your bookkeeping program at the date that is on the bill then file it into the paid bills file at month/date of the bill. This all depends on whether or not your bookkeeping program has a creditors/bills option. If you are only keeping a cash book, then your bill is entered into the bookkeeping program at the date you paid the bill, so you will file it into the month of the payment. Another method is to simply file all the bills away into one file, whether paid or unpaid, and keep track of the ones you haven’t paid using a spreadsheet. 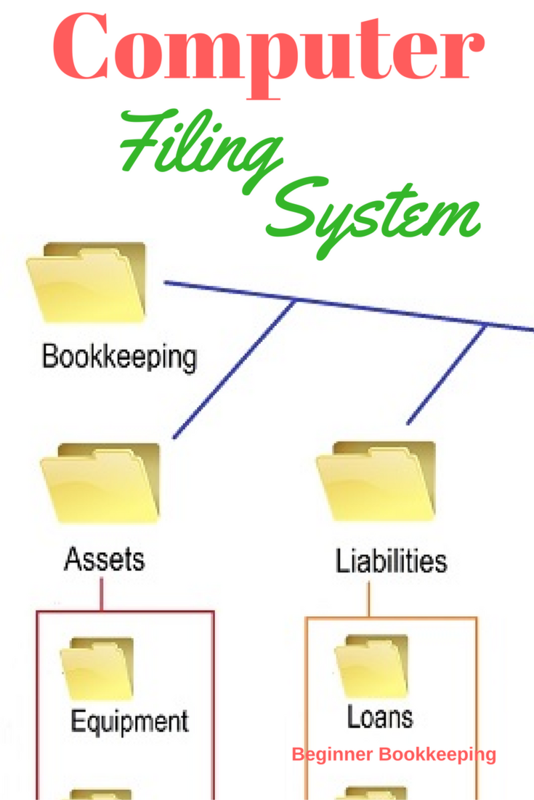 Business filing system tip - put the latest documents near the top. If your financial year runs from January to December you would put all your months back to front, so January is at the bottom and December at the top. This is so that as the year goes on you always have the latest document at the top and you are not having to move months of work over the prongs to get to the latest ones near the bottom. Another method is to file the sales invoices in order of invoice number whether paid or unpaid, keeping track of unpaid ones using a spreadsheet. That way there is only ever one file or section for sales invoices. Of course, if your bookkeeping software has the capacity to track accounts receivable and show you which invoices aren’t paid, then you don’t need a spreadsheet and having only one file for sales invoices is the better option. If you have more than one bank account it will be easier if you keep the statements in separate dividers for each bank account and also keep the reconciliation reports in separate dividers for each bank account, and separate from the bank statements. So bank account No 1 will have a section for the monthly/weekly statements, and a separate section for the monthly/weekly bank reconciliations. Bank account No. 2 will have it's own sections. You can head these up with either the bank account type - daily transactions account, savings account, tax account etc., or use the account number. Business filing system tip is to not staple documents in the top left corner – it really isn’t necessary to staple everything. Stapled corners become bulky and prevent documents lying flat and neat inside the folder. The bulky bits curl over and make it hard to keep the file in good order. You can keep the credit card statements in their own section or you can keep them with the bills. Some bookkeepers enter the credit card statements into their bookkeeping system as a creditor, listing out each transaction on a separate line so it is coded correctly, and then pay it off like a normal bill. Some bookkeepers enter them into the bookkeeping system as a bank account and reconcile them like a bank account so therefore you can treat them in the business filing system the same way you would a normal bank statement. A business will have different types of tax to take care of, the main ones being payroll tax, sales tax and income tax. File documents relating to these different types of tax into their own tax sections within the business filing system. Keep the two types of information separate in your business filing system. Your employee information will contain their job applications, resumes, tax/pension forms, personal details etc. The payroll section or file will contain the management reports for each weekly, fortnightly or monthly pay that you process for your employees. It is important to keep a separate section for any business loans or business mortgages that are taken out. In the Loans section you should keep all the loan documentation, payment schedules and loan statements etc. because your accountant will want to see these when preparing your annual accounts and compiling your tax. Also, for loans that relate to vehicles, buildings or some other type of equipment (opposed to a straight forward cash loan) keep copies of the vendor invoices with the loan documentation. If you are working from your house with room set aside as an office, then you might also like to keep copies of your personal mortgage statements in the loans section too because you can claim a percentage of the interest payments as an expense in the business to reduce tax. This is for any equipment you purchase that is deemed as an asset (in some countries this is office equipment or vehicles etc that cost more $400 or $500). You should keep copies of the invoices/receipts in the assets section. You generally will have the invoice in your creditors folder, but you need a copy of the invoice in the assets folder as these are documents that your tax accountant will also want to view at the end of the year and it will be far easier to find them if you have copies ready in your assets folder. This will be all the documents produced when you set up your business especially if you applied for an official company name and registered the business with your country’s registered business provider, setting it up as a corporation or limited liability company. You may also have annual renewals to file in this regard. Your tax accountant might be taking care of this for you and so you might not need to have this file. Most correspondence these days is done by email so you will probably have very little to keep in this section of your business filing system. Keep your emails in a systematic way within your email program by opening folders underneath your ‘Inbox” folder. If your bills arrive by email, still print the bill off and put it in your filing system, but then move the email containing the bill to a folder which you can call ‘Creditors’ or the name of the vendor or some place you know you can find it inside your email program. For correspondence you receive in the post you may be able to simply file it in date order in the correspondence section putting the most recent document at the top. For important correspondence that you receive a lot of, such as letters from your lawyer, keep a separate section called Legal along with copies of invoices from your lawyer. Every time you receive a document file it into its appropriate section or folder right away! Don’t have a basket on your desk that starts filling up with everything received because you will become overwhelmed with papers. 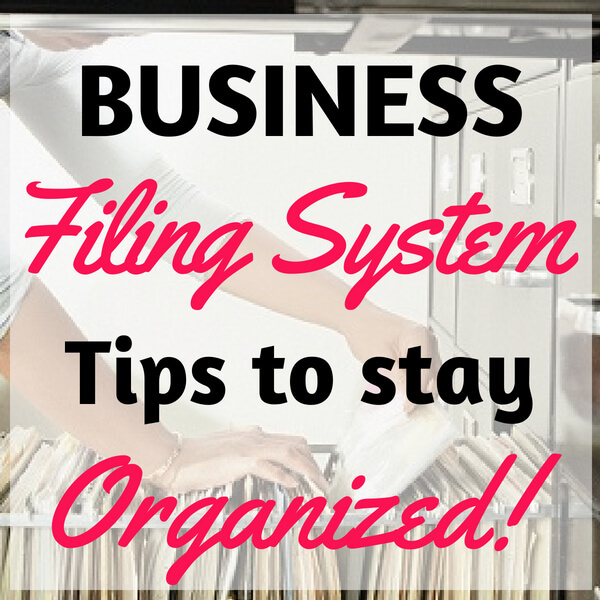 Your business filing system is an important aspect of your business. An orderly system will keep you sane. It does take effort and some pre-planning and preparation, but once it is set up you will be ecstatic you did it and it will lift a huge weight from your mind.